It is no secret that I do judge books by their cover. I should be ashamed of myself as a professional in the field of children's literature, but I am not. In fact when I speak to groups of children about books and ways to select books, I openly admit that I am guilty of this. 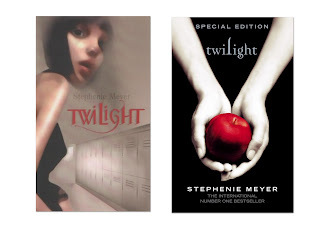 My argument is that a books' cover only has ONE job, and that is to make you want to pick up the book. I also say that the cover alone is not enough to make me read/buy/borrow the book, I read the blurb, see who the author is, read a bit, but it's often the cover that has made me pick it up. 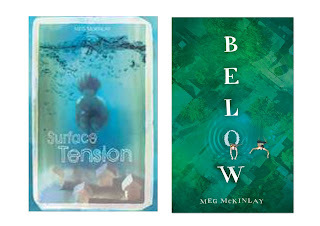 What made me think of this is that I recently saw a book called Below by Meg McKinlay (see above), and the cover got my attention, I thought it was weird that I didn't know the book because Meg McKinlay is an Australian author. When I read a bit about it I thought 'I recognise that story?' and I realised that it was just the US edition of an Australian book called Surface Tension, a book I haven't read! 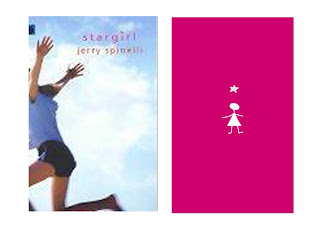 There are other examples, like the cover for Stargirl by Jerry Spinelli (see right). I went for years not wanting to read this book, simply because the cover didn't even make me want to pick it up, but when the shiny pink cover came out, I jumped on it, and it is still one of my all time favourite books. I also use the Twilight book (see left) as an example when I visit schools. Covering the title, I show them the original edition (the image on the left) and ask who would pick this book up. Very few hands go up, but when I show then the new cover it's a different story. It's not something that people like to admit, but the cover does matter. As I mentioned above, there are other ways I make decisions on what to read besides the cover, I am not THAT bad. When it's an author I love, or the new book in a series that I am hooked on, it wouldn't matter if the cover was made from brown paper, I would still read it, but I am already a reader. For those just starting out on their reading journeys, with no real idea of where they want to go, I think the cover plays a huge part in the decision about what gets picked up and what gets left on the shelf.